When a friend of mine asked me to make a veggie platter for our other friends baby shower, I was instantly thinking of a yummy dressing idea that would make the dish. 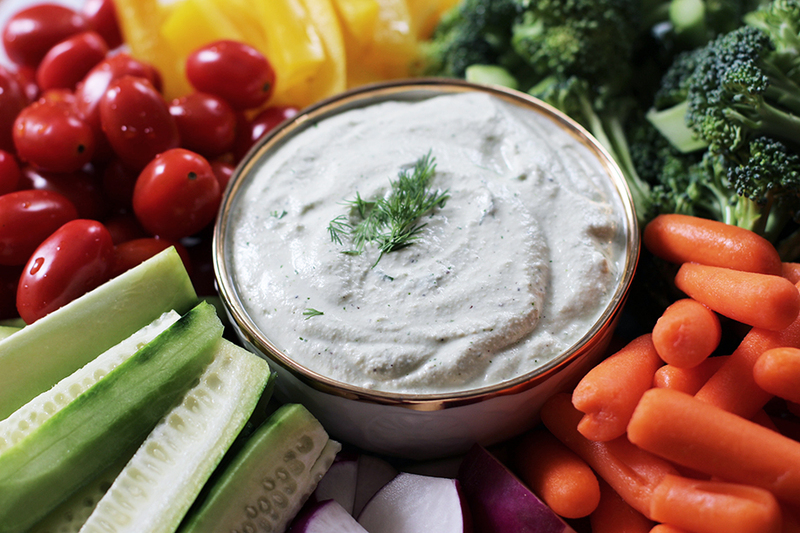 This cashew “ranch” is super easy to make, vegan and packed with flavor. The creaminess of the cashews make up for the fact that there is no mayo in this dressing. I personally have always hated mayo, so raw cashews have always been my favorite substitute in creamy dressing recipes. The baby shower was a super success, as was the veggie plate. 1.) Rinse and drain the soaked cashews. 2.) Place all ingredients in high-speed blender and blend until smooth. Serve with veggies, or thin the dressing out with a little more lemon juice or water, and serve over your favorite salad or bowl.